The state Emergency Operations Center activates to various levels depending on the nature of an incident. Our normal status is what we call Daily Operations. When necessary, we follow ascending levels of activation: Level 3 – Monitoring, Level 2 – Partial and Level 1 – Full. Those levels are reflected on the front page of the DEM website. With the looming threat of spring flooding, we have moved into monitoring mode to stay up to date on threats. 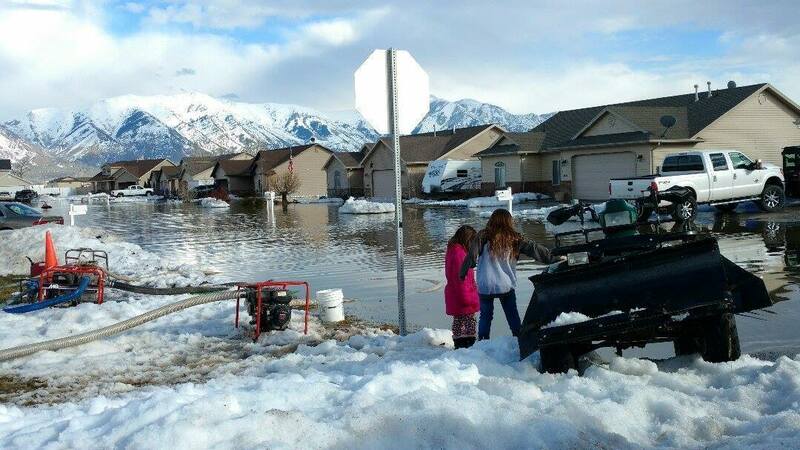 March is Flood Safety Awareness Month and we launched a new website to help Utahns get out of the flood myths and plan for disaster recovery. On top of that, we got word March 15 that the Gold King Mine is releasing toxic chemicals into the Animas River again. Drinking water The Four Corners Navajo Nation local chapters are experiencing winter condition issues, which includes drinking water and may affect access to residences and medical and water needs. A request from Navajo Mountain Chapter has come into the Governor’s Office for assistance to residents that do not have running water. They are requesting help with bottled water. Waiting for more clarification on needs. The Dollar Ridge Fire in Duchesne County has burned more than 70,000 acres, destroying at least 70 homes and prompting evacuations from Duchesne and Wasatch County. About 20 people stayed in a Red Cross shelter the night of July 2. An independent evacuation center was opened at the LDS church in Fruitland. The Pole Creek Fire and Bald Mountain Fire, both burning in Utah County burned more than 118,000 acres combined and nearly burned together. Though structures were threatened, no homes burned. Various communities in southern Utah County were in evacuation or pre-evacuation status. Property owners below those burn scars should prepare for the potential for debris flows that can come after an area has been burned. New 2nd hydrant installed successfully and is being utilized as of 10pm last night. Crews have gotten the main break up and out of the ravine and new sterilized pipe is on it’s way to the site to replace old and broken pipe. Goal is to have this pipe installed by this afternoon and working by tomorrow morning. There will be procedures such as flushing and pressurizing of the pipes that will take time. 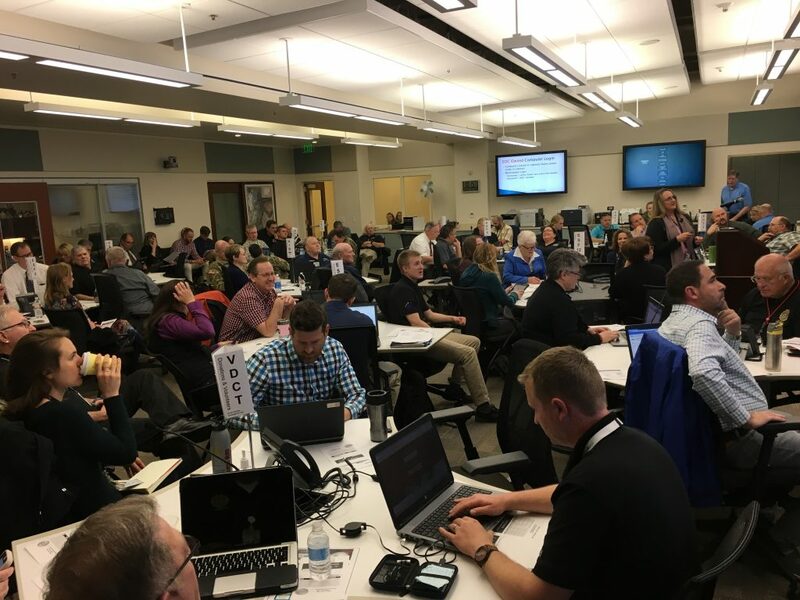 EOC actions The Division of Emergency Management hosted a conference call April 17 with state and local officials to learn more about the incident and to start state agency coordination. Regional liaison is staying in touch. EMAC requests: Utah deployed various resources to states needing assistance this year. Two Utah National Guard helicopters deployed to Texas for Hurricane Harvey, three state employees went to Florida to assist with human and animal services missions following Hurricane Irma and close to 50 local firefighters went to California to assist with their devastating fire season. Uintah Fire: Fire started in Uintah, Weber County, in the morning of Sept. 5, 2017, and eventually burned six structures. Various evacuations were in place, including South Weber Elementary, which was evacuated to Clearfield High School, and Uintah Elementary, which evacuated to the Dee Events Center. FEMA Region 8 approved a Fire Management Assistance Grant (FMAG) Tuesday afternoon to assist with firefighting costs. Severe Storm: Salt Lake City received two inches of rain in less than an hour on Wednesday, July 26, 2017. The water overwhelmed city infrastructure and damaged three Salt Lake City School District Schools and various homes. 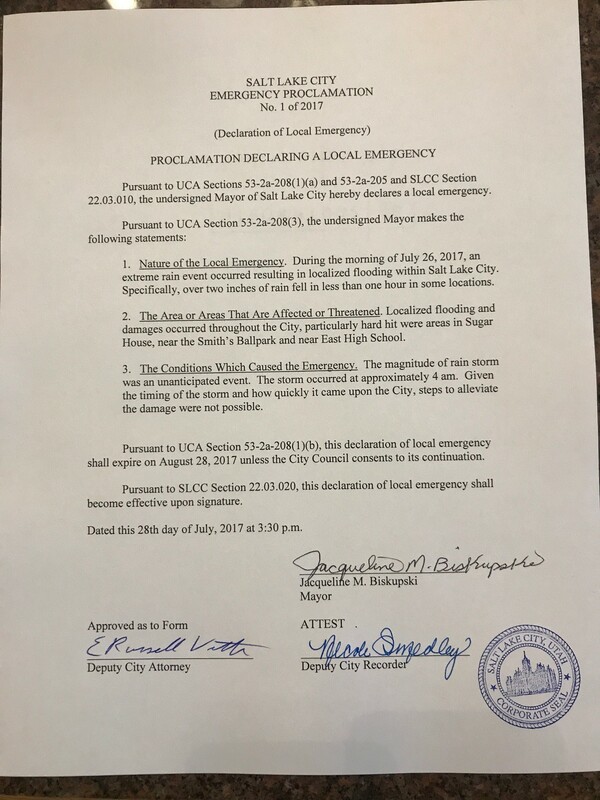 Salt Lake City Mayor Jackie Biskupski declared a local state of emergency Friday, July 28, 2017, during a press conference at the City and County Building. Wildfire Season: The National Weather Service has issued red flag warnings for much of Utah and fires have begun cropping up all over Utah. Brian Head Town was evacuated due to wildfire that has destroyed 13 dwellings damaged others. Brian Head Fire is no longer the largest fire burning in the United States. Water Emergency: Wayne County and the town of Torrey declared a local state of emergency (PDF) due to a break in the water line that feeds the water system. Torrey is on a boil order and residents have been asked to reduce their use of water. DEM has secured potable water to be delivered to the town until the system can be repaired. The system has been repaired and filled and is functioning properly as of 6/26/17. Flooding: The National Weather Service forecast included a potential for rain- or snowmelt-caused flooding, though much of it was expected to be nuisance flooding. Various local emergency declarations are in place and local entities have reported infrastructure damage. Red Cross at Level 3 Disaster Relief Operation. Governor Gary Herbert declared a state of emergency March 31, 2017. Utah received a major disaster declaration from the president on April 21, 2017. Utah DEM and FEMA continue working with local officials to write project worksheets to move disaster recovery forward. Activities: EOC monitoring flood potential and receiving information from the National Weather Service and local emergency managers. DEM will repost NWS social media messages and alerts through division accounts. DEM regional liaisons and PIO to keep in touch with with stakeholders. DEM purchased 11,000 sand bags for Box Elder, helped arrange for National Guard deployment to Box Elder and ordered various pumps for the community. DEM planning for preliminary damage assessments with affected counties. Activities: EOC monitored flood potential and received information from the National Weather Service. We received a few reports of localized flooding, though damage to homes was sparse. Home flooding was contained to some basements. DEM resposted NWS social media messages and alerts through division accounts. DEM regional liaisons and PIO kept in touch with with stakeholders. Activities: EOC was available for media monitoring related to election news throughout the day until poll closing or election results are announced. Activities: Throughout the season, Gov. Herbert issues a monthly executive order declaring that a state of emergency exists statewide to facilitate actions contained in the State Emergency Operations Plan. During the algae blooms, we held daily coordination calls as needed and worked with various members of the State Emergency Response Team. We coordinated with local responders and helped get sandbagging supplies to affected communities. Activities: Municipalities, the NWS and DEM were active on social media with warning and safety messages. Activities: DEM staff deployed to Hildale to support public information, planning, interagency coordination and damage assessments.